Bees are one of the most important insects on the planet. Not only do they create delicious honey, but they are also one of the leading pollinators in nature. Urban Backyard Beekeeping provides a greater advantage when it comes to bee-caring. Without bees, many plants and flowers would die out, including vegetables, coffee, and tea. With the bee population rapidly decreasing, the need for beekeepers is greater than ever. Read on for a complete guide on how to start your own backyard beekeeping colony. Check your local city codes to ensure that there are no laws against beekeeping in your backyard. While most major cities in the United States do not have laws against keeping honey bees on your property, there may be some ordinances in place. For example, your neighborhood may have a limit to the number of hives allowed at one time. To inform yourself about current beekeeping laws, contact your city’s non-emergency services department or check online for an ordinance listing. Your neighbors may be uncomfortable with the idea of having beehives near their property. Backyard beekeepers must take special precautions to ensure their bees don’t become a bother to other residents. In most cases, a neighbor’s major concerns are bee stings and natural hives forming on their property. A good beekeeper will be able to care for their bees in a way that should minimize the impact on a neighborhood. The best way to ease a neighbor’s concerns is to explain to them the beekeeping process to help put their minds at ease. It’s a good idea to keep a sign on your yard warning the neighborhood of your hive. There are a few basic tools that every backyard beekeeper will need in order to set up a successful honey bee hive. Wooden hives can be purchased or built from scratch, depending on how you want your hive to be set up. For beginners, we suggest purchasing a pre-assembled hive to make the set up easier. Beekeepers will also want to invest in a bee suit, made from a heavy material that will prevent any stinging. Beekeepers will also need a smoker, which is used to help keep the bees calm and can prevent swarming. You will also want to look for a hive tool, a small pry-bar with a blade used for various beekeeping purposes. Hives are best kept in an area with a high fence with a minimal amount of foot traffic and good exposure to the early-morning sun. The first step in setting up a backyard beehive is to build a hive stand, typically made with cement blocks and wooden planks. Hive stands help keep the hive off the ground, which will prevent flooding and help keep wild animals away. With the stand set, place the bottom board on top, followed by the hive body. Next, you’ll want to install the frames, which are stacked into the hive body like a filing cabinet. 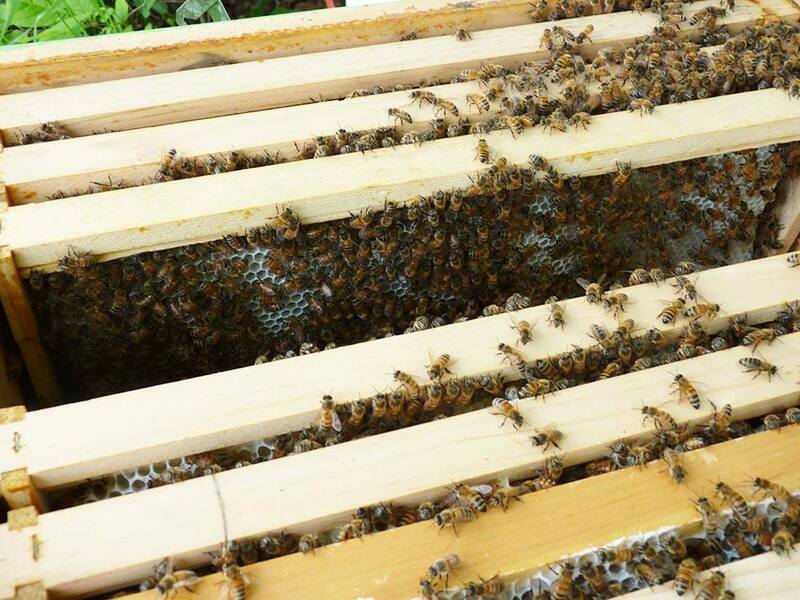 Most beekeepers will treat their frames with a wax foundation, which gives the bees a starting base for their hive. Hives also come with both internal and external covers to ensure the hive is safe. With your hive set up, it’s time to bring in the bees. While expert beekeepers can catch their own swarms, beginners will be able to purchase bee packages online or from a local beekeeper. There are two ways that you can purchase bees: packaged bees and nucleus colonies (Nucs). Packaged honey bees are typically sold in packages of 2, 3, or 5 pounds of bees. These packages come in a secure box that will not harm the bees in any way. However, it may take more time for bees to establish a working hive, as they have less to work on from the beginning. Nucs are mini bee colonies that come in 3-5 frames that can be installed directly into your hive. These frames are filled with brood (bee larvae), worker bees, and a Queen bee to lay eggs. Beginner beekeepers will find that Nucs are easy to install and take less work to establish a fruitful hive. There are two methods for installing packaged bees. The first method is to install by shaking out the bees into the hive. This is done by spraying the bees with sugar-water, which causes them to stick together and can prevent swarms from forming. Install the Queen by placing the cage near your comb or wax foundation, and then gently shake the box of bees into your hive. The second method is to block off the hive entrance and place the package directly into the hive, allowing the bees to exit on their own. Nucs are installed over the process of a few days, which will allow the bees to become acclimated to their new environment. 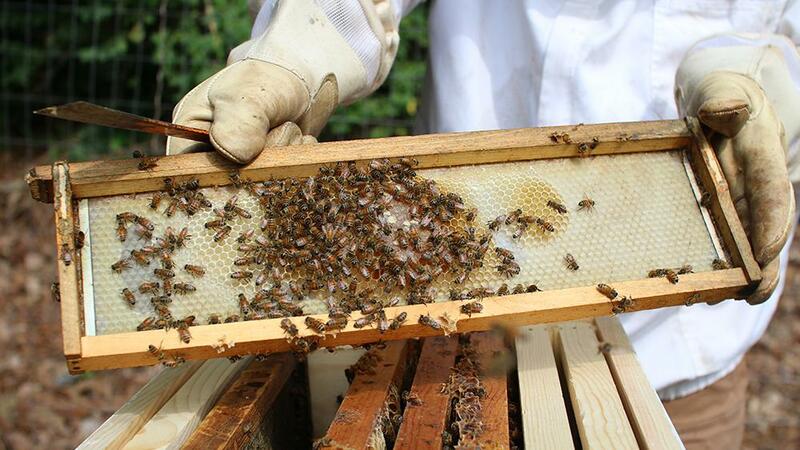 Place the Nuc directly on top of your hive and remove the screens covering the entrance. Allow the bees to take up to 48 hours to get a lay of the land and find their food before transferring the colony into your hive. To install the colony, remove the frames from the Nuc and carefully install them into your hive. Be sure to use your smoker to keep the bees calm during this process. You’ll want to make sure that the frames are placed into your hive in the same order you received them in. Honey bees need a few things in order to maintain a healthy, active hive. When first setting up your hive, you will want to provide your bees with food to make sure they are able to survive the first few days. Feed the bees using a 2:1 sugar water solution, which can be placed in a jar with holes poked into it. Bee feeding stations can be set up either inside the hive or in a separate box nearby. Continue feeding the bees until they are able to establish their colony and find the local source of nectar and pollen. Be sure to also check that the Queen has been released from her cage within a few days so she can start laying eggs to grow the colony.